Like usual, we procrastinated (actually just too busy) and we didn’t get around to carving our pumpkins until 1 hour before the trick-or-treaters started arriving. We had carved the Witch and the Ghost in years past. They’re both sort of 3-dimensional, and they look really cool close-up. New for us this year were the Gourds, and the Baseball Cap Wearing Bubble Blower. 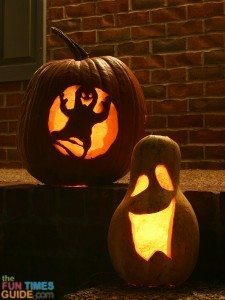 In addition to the Jeep pumpkin we carved earlier, these are our all-time favorite pumpkins to carve. 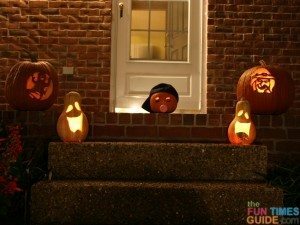 If you’re interested in trying these yourself, first, check out our easy-to-follow, step-by-step directionsfor carving pumpkins in general. 3. Remember to buy plenty of tea-light candles ahead of time. The larger pumpkins need more light. 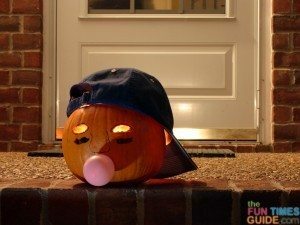 Plus, and the Bubble Blower pumpkin has such tiny carved spaces (just the 2 small eyes) so you need a really powerful light inside to be noticeable.